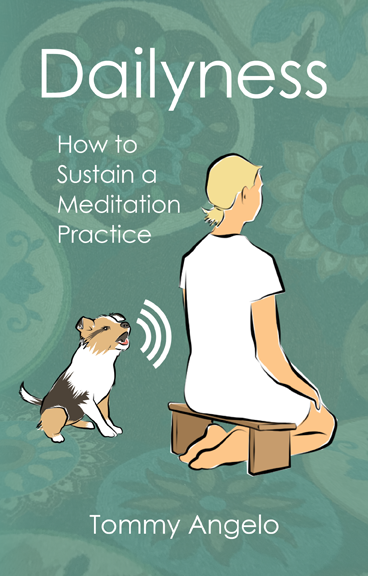 Dear reader: If you wish you did more meditating than you do now, you might want to check out my book, Dailyness. Below is an excerpt. First let’s look at what guided and unguided meditation have in common. Doing either one means you have committed time and effort to making yourself less unhappy. And any amount of either is way better than none. Walking is a great form of exercise and has many benefits, but it doesn’t build muscle mass. To build muscle, you need to do resistance training, such as lifting weights. You push the muscles to their limits, over and over. Sitting meditation is like weight lifting for the mind. And guided meditation is like walking. Walking is not a better or worse form of exercise than lifting weights. They both rate to make your life better. That’s why I think anyone who has benefited from guided meditation should look into sitting meditation, not as an alternative, but as an add-on, and see how it fits. Likewise for sitters who have not been guided. One big difference between guided and unguided meditation is accessibility. Guided meditation requires electronics, whereas unguided meditation requires only that you not be sleeping. You can make yourself still, many times per day if you like, without technical assistance. So for access alone, it makes sense to have a form of meditation in your tool belt that you can do without electricity. Another difference is that with unguided meditation, you are totally alone with your thoughts, which, again, is not better or worse than guided meditation, but it isa different experience, with its own perks and problems. Dailyness is available in print, ebook, and audiobook at all the usual places.